What is part B & C? Only 145 more counts to read. Thank You To The Jurors! You Got It Right!!! Justice!!! What is part b and c? This whole thing makes me so sad. I don't feel pleasure in this. Matt McQuinn was from my area. He died protecting his girlfriend. She is back here now. I wish this made something better. But justice has been done. I hope it brings the families some sense of peace. @jward12 . . .congrats, what a beautiful way to celebrate life!!!! Congrats, jward, nice to hear that you are all doing well. We were asking about you. im not shocked, its kinda like a DUH! Defense seems to really be staring down jury while guilty verdicts being read...wonder if they're thinking if death penalty is actually possible again in CO...? 'Not stating my opinion on death-ONLY trying to "read minds" of defense team. JWARD!!!! Way to go Kid!!!! Great luck and much happiness!!!! Hey @jward12 just in time. Glad to hear all is well. Why is Part B left unanswered? Is that due to instruction not to? @PA Watcher . . .you never know, so glad it was such a quick verdict . . .still have butterflies tho! There you have it. I'm so glad that the victim's families and survivors have this guilty verdict before the anniversary date on Monday. Sounds like this part of the verdict came out exactly as expected. I'm really glad that it brought justice for all those affected! So relieved. Prayers going out for all touched by this case. Justice is served. Thank you Colorado. Thanks ch 7-part b is sanity, c is deadly weapon. 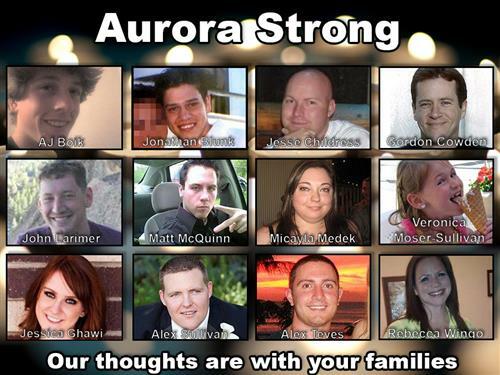 Is James Holmes the one in blue? I know that the court room was told not to have an outburst, but that would be so hard. Congrats jward! Happy for good news in the midst of all this. Part B was insanity plea. They rejected it totally, from what I can assess. What is "Part B" that keeps being left "unanswered"?